Unit Digit Method (Hit and trial approach) applies to those Cryptarithmetic Problems, where you don’t have even a single clues to start solving the cryptarithmetic problem. 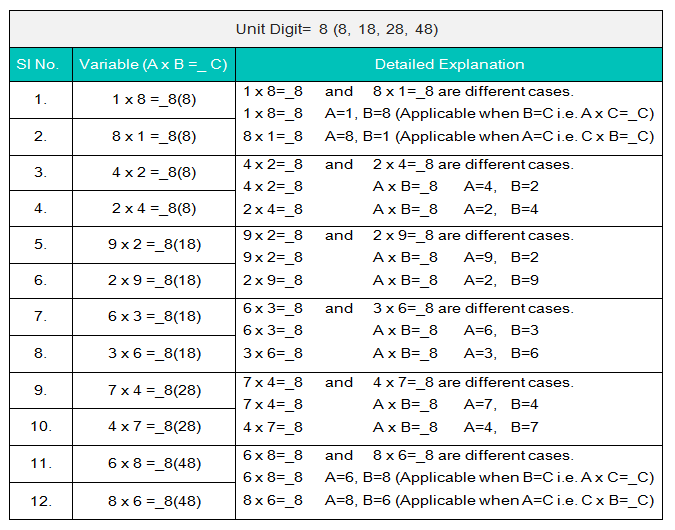 In this case you have to start hit and trial with the possible values of unit digit of the multiplication problem. Solving a Cryptarithmetic Problem by using this method will take some time but, after applying all the cases of this method, you will definitely reach to the solution. It will take nearly 10-12 minutes to solve the problem. Please have patience while reading this article, It will take some time to understand the whole flow. 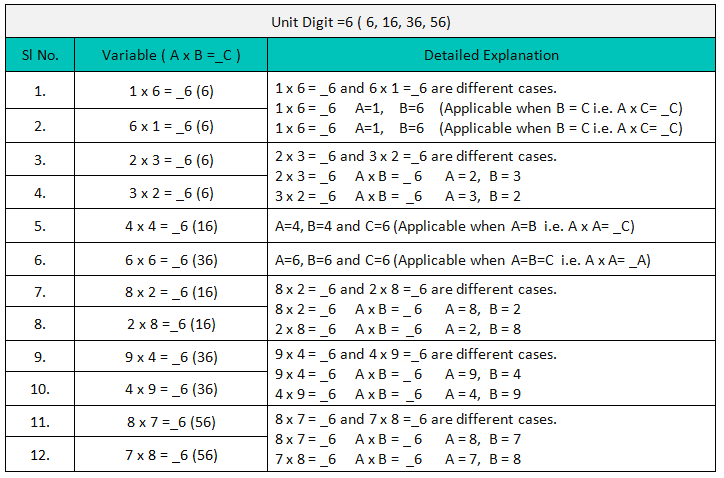 Before you study Unit Digit Method, you should have a basic understanding of how to solve the Cryptarithmetic problems. Firstly divide the cryptarithmetic problem into three parts. If it is a 3 x 3 Cryptarithmetic Problem, then you have to convert it into 3 x 1 problem. After dividing the problem in three parts, analyse all the parts very closely and try to collect some clue. Now, you have to choose one among 3 which has maximum number of clues. Now, you have to select one from three which has maximum number of clues.i.e. maximum number of variables getting repeated. Now, you have to start hit and trial with the possible values C i.e. Now check for Case 2 and Case 3 only. Rejected as,  even after taking the value of W=9, You will never get 77. Alphabets can take up only one distinct value. Alphabets can only take up values between 0-9. Decoded numbers can’t begin with 0, for example, 0813. 19 is the max value with a carryover for two one-digit number in the same column. Carry over can only be 1. Be patient there is no specific rule, you will only learn how to solve when you see examples. Numbers can’t begin with 0 in the below example G or B ≠0. Values are distinct thus for e.g. if G=1 then if at a later point in time you get G=2 you’re solving wrongly. then possible values of P and Q, then P = 5 and Q = 3, 7, 9.
solve any problem within very less time. would not be valid. This means that S+L=E has a carry over of 1.
use the trial and error method substituting values for the letters keeping all the above points in mind. with 2’s gives us two contradictions. equal to 7 (S is already equal to 7) and A+A does not produce a carry. As clear from the name, which is formed by joining two words Crypto meaning hiding and solving and Arithmetic means standard traditional operations like—addition, subtraction, multiplication and division. They are frequently asked in eLitmus Cryptarithmetic Problems. The world’s best-known alphametic puzzle is undoubtedly SEND + MORE = MONEY. give some time to them. These are highly important as most students(90%) are not able to answer questions based on Cryptarithmetic. only 6-7 questions in Reasoning section. Go through the rules properly to understand the basic and tricks in the first link on this page. Then attend to some tutorials and solved problems given in the second link on this page. Each question is followed by two statements. You have to decide whether the information provided in the statements is sufficient for answering the question. If the question can be answered by using one of the statements alone, but cannot be answered by using the other statements alone. If the question can be answered by using either statement alone. If the question can be answered by using both statements together, but cannot be answered by using the either statement alone. If the question cannot be answered even by using both the statements together. Question 1: Who among P, Q, T, V and M is exactly in the middle when they are arranged in ascending order of their heights? V is taller than Q but shorter than M.
T is taller than Q and M but shorter than P.
From I, we have: M > V > Q.From II, we have: T > Q, T > M, P > T.Combining the above two, we have: P>T>M>V>Q i.e. Q<v<m<t<p.< p=””>Clearly, M is in the middle. What is the value of |x|? The absolute value of x, |x|, is always positive or 0, so this only determines that x is negative or 0; NOT SUFFICIENT. Exactly two values of x (x= ±2) are possible, each of which gives the value 2 for |x| SUFFICIENT. Question: Which code word stands for ‘good’ in the coded sentence ‘sin co bye’ which means ‘He is good? In the same code language, ‘co mot det’ means ‘They are good’. In the same code language, ‘sin mic bye’ means ‘He is honest’. Explanation: In the given statement and I, the common word is ‘good’ and the common code word is ‘co’. So, ‘co’ is the code for ‘good’.In the given statement and II, the common words are ‘He’ and ‘is’ and the common code words are ‘sin’ and ‘bye’. So ‘sin’ and ‘bye’ are the codes for ‘He’ and ‘is’. Thus, in the given statement, ‘co’ is the code for ‘good’. If x is negative, is x < – 3 ? Given that x3 < -9, if x = -4, then x3 = -64, and so x3 <-9 and it is true that x < -3. However, if x = —3, then x = —27, and so x3 < —9, but it is not true that x < —3; NOT SUFFICIENT. If x and y are integers, is xy even? x/y is an even integer.. Determine if xy is even; Since x and y are consecutive integers, one of these two numbers is even, and hence their product is even. For example, if x is even, then x = 2m for some integer m, and thus xy =(2m)y =(my)(2), which is an integer multiple of 2, so xy is even; SUFFICIENT. If x /y is even, then x/y= 2n for some integer n, and thus x = 2ny. From this it follows that xy =(2ny)(y) =(ny2)(2), which is an integer multiple of 2, so xy is even; SUFFICIENT. Paula and Sandy were among those people who sold raffle tickets to raise money for Club X. If Paula and Sandy sold a total of 100 of the tickets, how many of the tickets did Paula sell? Sandy sold 8 percent of all the raffle tickets sold for Club X.. If Paula sold p tickets and Sandy sold s tickets, then p + s = 100. Since Sandy sold 2/3 as many tickets as Paula, s= (2/3)p. The value of p can be determined by solving the two equations simultaneously; SUFFICIENT. Since the total number of the raffle tickets sold is unknown, the number of tickets that Sandy or Paula sold cannot be determined NOT SUFFICIENT. What is the number of cans that can be packed in a certain carton? No information about the size of the cans is given; NOT SUFFICIENT. No information about the size of the carton is given; NOT SUFFICIENT. Taking (1) and (2) together, there is still not enough information to answer the question. If the carton is a rectangular solid that is 1 inch by 1 inch by 2,304 inches and the cans are cylindrical with the given dimensions, then 0 cans can be packed into the carton. However, if the carton is a rectangular solid that is 16 inches by 12 inches by 12 inches and the cans are cylindrical with the given dimensions, then 1 or more cans can be packed into the carton. If n is an integer, is n even ? n^2 -1 is an odd integer. 3n + 4 is an even integer. Since n2 —1 is odd, n2 is even and so n is even; SUFFICIENT. Since 3n+ 4 is even, 3n is even and so n is even; SUFFICIENT. If n is an integer, is n+ 1 odd ? n+ 2 is an even integer. n-1 is an odd integer. Since n+ 2 is even, n is an even integer, and therefore n+1 would be an odd integer; SUFFICIENT. Since n-1 is an odd integer, n is an even integer. Therefore n+ 1 would be an odd integer; SUFFICIENT. Is x a negative number? x + 3 is positive. Subtracting 9x from both sides of 9x > lOx gives 0 > x, which expresses the condition that x is negative; SUFFICIENT. Subtracting 3 from both sides of x+ 3 > 0 gives x > -3, and x > -3 is true for some negative numbers (such as -2 and -1) and for some numbers that aren’t negative (such as 0 and 1); NOT SUFFICIENT. What is the tens digit of positive integer x? x divided by 100 has a remainder of 30.
x divided by 110 has a remainder of 30. Having a remainder of 30 when x is divided by 100 can only happen if x has a tens digit of 3 and a ones digit of 0, as in 130, 230, 630, and so forth; SUFFICIENT. When 140 is divided by 110, the quotient is 1 R 30. However, 250 divided by 110 yields a quotient of 2 R 30, and 360 divided by 110 gives a quotient of 3 R 30. Since there is no consistency in the tens digit, more information is needed; NOT SUFFICIENT. If k is an integer such that 56 < k < 66, what is the value of k? If k were divided by 2, the remainder would be 1. If k + 1 were divided by 3, the remainder would be O. Determine the value of the integer k, where 56<k< 66 It is given that the remainder is 1 when k is divided by 2, which implies that k is odd Therefore, the value of k can be 57, 59, 61,63, or 65; NOT SUFFICIENT. It is given that the remainder is 0 when k + 1 is divided by 3, which implies that k + 1 is divisible by 3. Since 56 <k <66 (equivalently, 57 <k+1 <67), the value of k + 1 can be 60, 63, or 66 so the value of k can be 59, 62 or 65; NOT SUFFICIENT. Taking (1) and (2) together, 59 and 65 appear in both lists of possible values for k; NOT sufficient. 1. What are the ages of two individuals, X and Y ? (I) The age difference between them is 6 yr.
(II) The Product of their ages is divisible by 6. 2.Is x + y – z + t even ? (I) x + y + t is even. (II) t and z are odd. 3.What is the number X ? (I) The LCM of X and 18 is 36. (II) The HCF of x and 18 is 2. 4. What is the length of the rectangle ABCD ? (I) Area of rectangle is 48 sq. unit. (II) Length of diagonal is 10 unit. 5. What is the first term of an arithmetic progression of positive integers ? (I) Sum of the squares of the first and the second term is 116. (II)The fifth term is divisible by 7. 6. What is the price of bananas ? (I) With Rs 84, I can buy 14 bananas and 35 oranges. (II) If price of bananas is reduced by 50%,then we can buy 48 bananas in Rs 12. 7. What is the area of the triangle ? (I) Two sides are 41 cm each. (II) The altitude to the third side is 9 cm long. 8. What is the profit percentage ? (I) The cost price is 80% of the selling price. (II) The profit is Rs 50. 9. What is the value of x, if x and y are consecutive positive even integers ? 10. If x, y and z are real numbers, is z-x is even or odd ? (II) xy + yz + zx is even. 1.What is the cost price of the chair ? (I) The chair and the table are sold,respectively, at profits of 15% and 20%. (II) If the cost price of the chair is increased by 10% and that of the table is increased by 20%,the profit reduces by Rs 20. 2.What is the area bounded by the two lines and the co-ordinates axes in the first quadrant ? (I) The lines intersect at a point which also lies on the lines 3x – 4y = 1 and 7x – 8y = 5. (II) The lines are perpendicular and one of them intersects the Y-axis at an intercept of 4. 3.What is the ratio of the volume of the given right circular cone to the one obtained from it ? (I) The smaller cone is obtained by passing a plane parallel to the base and dividing a the original height in the ratio of 1 : 2. (II) The height and the base of the new cone are one-third those of the original cone. 4.What is the speed of the car ? (I) The speed of a car is 10 more than that of the a motorcycle. (II) The motorcycle takes 2 Hours more than the car to cover 100 Km. 5.Three friends P, Q and R are wearing hats,either black or white. Each person can see the hats of the other two persons. What is the color of P’s hat ? (I) P says that he can see one black hat and one white hat. (II) Q says that he can see one white hat and one black hat. 6.What are the values of x and y ? 7.What are the values of 3 integers a, b and c ? 8.Is the number completely divisible by 99 ? (I) The number is divisible by 9 and 11 simultaneously. (II) If the digits of the numbers are reversed, the number is divisible by 9 and 11. 9.What is the value of a3 + b3 ? 10After what time will the two persons Tez and Gati meet while moving around the circular track? Both of them start at the same point and at the same time ? (I) Tex moves at a constant speed of 5 m/s , while Gati starts at a speed of 2m/s and increases his speed by 0.5m/s at the end of every second thereafter. (II) Gati can complete one entire lap in exactly 10s. Mark AIf the question can be answered by using one of the statements alone, but cannot be answered by using the other statements alone.Mark BIf the question can be answered by using either statement alone.Mark CIf the question can be answered by using both statements together, but cannot be answered by using the either statement alone.Mark DIf the question cannot be answered even by using both the statements together. 1.What is the price of mangoes per kg ? (I) 10 kg of mangoes and two dozen of oranges cost Rs 252. (II) 2 Kg of mangoes could be bought in exchange for one dozen oranges. 2.What are the ages of three brothers ? (I) Product of their ages is 21. (II) The sum of their ages is not divisible by 3. (I) n is divisible by 3, 5, 7 and 9. 4.Two types of widget, namely type A and B are produced on a machine. The number of machine hours available per week is 80. How many widgets of type A must be produced ? (I) One unit of type A widget requires 2 machine hours and one unit of type B widget requires 4 machines hours. (II) The widget dealer wants to supply at least 10 units of type A widget per week and he would not accept less than 15 units of type B widget. 5.What are the values of 3 integers a, b and c ? 6.Given that, X and Y are non-negative .What is the Value of X ? 7.10 boys went to a neighboring orchard. Each boy stole a few mangoes.What is the total number of mangoes they stole ? (I) The first boy stole 4 mangoes, the fourth boy stole 16 mangoes, eighth boy stole 32 mangoes and the tenth boy stole 40 mangoes. (II) The first boy stole the minimum number of mangoes and the tenth boy stole the maximum number of mangoes. 8.What are the values of m and n ? (I) n is an even integer, m is an odd integer and m is greater than n.
(II) Product of m and n is 30. 9.What is the value of integer n ? 10If the selling price were to be increased by 10%, the sales would reduce by 10%. In what ratio would be profits change ? (I) The cost price remains constant. (II) The cost price increased by 10%. 1.If m is an integer, is m odd ? (I) m/2 is not an even number . (II) m – 3 is an even integer. 2.Total amount of Rs 38500 was distributed among Praveen, Ranjan and Nitesh. How much does each get ? (I) Praveen gets 2/9 of what other two get. (II) Ranjan gets 3/11 of what other two get. 3.Of the 300 students who speak French,Russian or both, how many speak only French ? (I) 196 students speak both French and Russian. (II) 58 students speak Russian only. 4.If the teacher adds four students to the class,can he evenly distribute the class in groups of 4 students ? (I) If 12 students are added to the class,then the teacher can divide students evenly in groups of 8. (II) Initially, the number of students is not divisible by 8. 5.Is average (arithmetic mean) score of GMAT 500 ? (I) Half of the students scored more than 500 and half less than 500. (II) Highest is 800 and lowest is 200. 6.Is x = y ? 7.Is |x – 2| < 1 ? 8.Two Friends,Ram and Gopal, bought apples from a wholesale dealer. How many apples did they buy ? (I) Ram bought one-half the number of apples that Gopal bought. (II) The wholesale dealer had a stock of 500 apples. 9.What is the value of X ? (I) X and Y are unequal even integers,less than 10 and X/Y is an odd integer. (II) X and Y are even integers,each less than 10 and product of X and Y is 12. 10What are the values of m and n ? (I) n is an even integer m is an odd integer and m is greater than n.
1.Triangle PQR has angle PRQ equal to 90 degrees. What is the value of PR+RQ ? (I) Diameter of the inscribed circle of the triangle PQR is equal to 10 cm. (II) Diameter of the circumscribed circle of the triangle PQR is equal to 18 cm. 2.How many people are watching TV programme P ? (I) Number of people watching TV programme Q is 1000 and number of people watching both the programme P and Q is 100. (II) Number of people watching either P or Q or both is 1500. 3.Let X be a real number.Is the modulus of X necessarily less than 3 ? 4.Consider three real numbers, X,Y and Z. Is Z is the smallest of the these numbers ? (I) X is greater than at least one of Y and Z. (II) Y is greater than at least one of X and Z. 5.There is a circle with centre C at the origin and radius r cm. Two tangents are drawn from an external point D at a distance d cm from the centre. What are the angles between each tangent and X-axis ? (I) The co-ordinates of D are given. (II) The X-axis bisects one of the tangents. 6.A small storage tank is spherical in shape. What is the storage volume of tank ? (I) The wall thickness of the tank is 1 cm. (II) When an empty spherical tank is immersed in a large tank filled with water,20 L of water overflows from the large tank. 7.The average weight of students in a class is 50 Kg. What is the number of students in the class ? (I) The heaviest and the lightest members of the class weigh 60 Kg and 40 Kg. (II) Exclusion of the heaviest and the lightest members from the class does not change the average weight of the students. 8.A circle circumscribes a square. What is the area of the square ? (I) Radius of the circle is given. (II) Length of the tangent from a point 5cm away from the centre of the circle is given. 9.What is the price of the tea ? (I) Price of coffee is Rs 5 more than that of tea. (II) Price of coffee was Rs 5 less than the price of a cold drink which cost three times the price of tea. 10Radha and Megha appeared in an examination.What was the total number of questions ? (I) Radha and Megha together solved 20% of the paper. (II) Radha alone solved 3/5th part of the paper solved by Megha. Six cricketers from six different nations stay in a five star hotel in different rooms. Each of them eats a different variety of food in a meal and hits different number of sixes in an average match. Now read the following clues carefully. ● The player in room No. 142 eats twice as much as the number of varieties eaten by player, who hits an average of 8 sixes per match, in a meal.● The player from New Zealand and the player in room no. 146 eat a combined 40 varieties in a meal.● The player from India eats 8 varieties less than the player from England but hits 10 more sixes in an average match. ● Four times the number of varieties in a meal eaten by the player in room No. 144 is lesser than the number of sixes hit by him in an average match. ● The player in room no. 143 eats 12 varieties per meal and hits 8 sixes on an average in each match. ● The player who eats 16 varieties per meal hits 24 sixes per match on an average. ● The player in room No. 145 eats 8 varieties per meal and hits 2 sixes less than the player from the Pakistan on an average in a match. 1.In which room is the Australian player staying ? What is the average number of sixes hit by the Indian player ? 3.How many varieties of food is eaten by English player in his meal ? The player of which country is staying in room No. 146 ? 5.The player of which country hits 24 sixes on an average ? Mr. Bankatlal acted as a judge for the beauty contest. There were four participants, viz Ms. Andhra Pradesh, Ms. Uttar Pradesh, Ms. West Bengal and Ms. Maharastra. Mrs. Bankatlal, who was very anxious about the result asked him about it as soon as he was back home. Mr. Bankatlal just told that the one who was wearing the yellow saree won the contest. When Mrs. Bankatlal pressed for further details, he elaborated as follows.● All of them were sitting in a row. ● All of them wore sares of different colors, viz. green, yellow, white, red. ● There was only one runner-up and she was sitting beside Ms. Maharastra. ● The runner-up was wearing the green saree. ● Ms. West Bengal was not sitting at the ends and was not the runner up. ● The winner and the runner-up are not sitting adjacent to each other. ● Ms. Maharastra was wearing the white saree. ● Ms. Andhra Pradesh was not wearing green saree. ● Participants wearing yellow saree and white saree were at the ends. 1.Who wore the red saree ? 3.Which saree was worn by Ms. Andhra Pradesh ? 4.Who was the runner-up ?